I've read mixed reviews regarding Tangerine by Christine Mangan. The reviews have been so mixed that I wasn't sure I even wanted to read Tangerine despite the fact that it sounded like an intriguing/must read novel. However, when I came across the paperback edition of Tangerine by Christine Mangan at a Free Little Library in Solana Beach, California, I couldn't pass up the opportunity to give it a try. After all, what did I really have to lose? If you love psychological thrillers with unreliable narrators, two female protagonists, toxic female friendships, and a novel set in an exotic locale, then Tangerine by Christine Mangan may be the next novel you'll want to read! Overall, I enjoyed reading Tangerine by Christine Mangan. I liked the alternating chapters featuring the point of view of either Alice or Lucy. Each alternating chapter added an element of suspense as Tangerine unfolded slowly. The storyline's tension slowly builds as to reveal what the 'big secret' is between Alice and Lucy that ended their friendship in college. Additionally, both women appear mentally unstable/damaged in some way throughout Tangerine. Alice is the most fragile of the two women and is easily manipulated, while Lucy is a strong, confident, independent, and manipulative woman. Do I dare write that Lucy seems to be a sociopath? 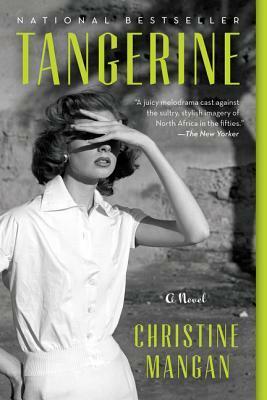 Tangerine by Christine Mangan is multifaceted. It contains elements from 19th century Gothic novels/literature with references of Jane Eyre being particularly hinted at in Tangerine. There is also the focus on such "classic Gothic tropes as tyrannical husbands" (page 311, author's note). Additionally, Elle magazine is quoted as saying "Fans of The Talented Mr. Ripley will love this fast-paced thriller." I was also reminded of the unstable character Glenn Close played in the movie, 'Fatal Attraction', while reading Tangerine. The city of Tangier itself plays a major role in Tangerine and can even be considered a character as well. I enjoyed Christine Mangan's writing style very much and her way of describing characters, scenes, and emotions. I look forward to seeing what she writes in the future. The epilogue for Tangerine was a bit of a disappointment though... It wasn't horrible, but I felt it could have gone out with a bang instead of the mild mannered way in which it did. I am giving Tangerine by Christine Mangan a rating of 3 stars out of 5 stars. Well I have to say that yours is the first review that made me want to read this one. Glad you enjoyed reading my review of Tangerine. Great review, Lisa! Several bloggers I follow loved this novel, which makes me want to read it. Thank you, Carmen, for leaving me comment. I am glad you enjoyed my review of Tangerine. I've heard this novel may be turned into a movie? I was not aware of that but given the love it has received from book bloggers I'm not surprised. I'll be watching when/if it comes.